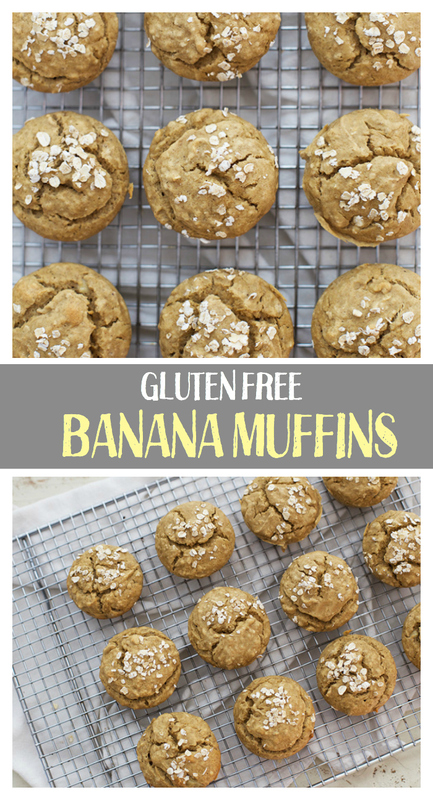 Gluten Free Banana Muffins – These gluten free (or not!) 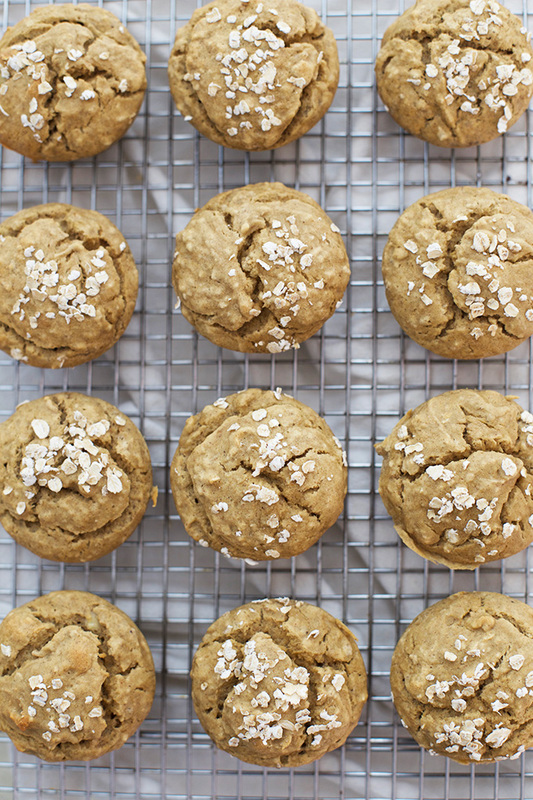 banana muffins are light, airy, and close-your-eyes good. The perfect easy baking project! Milo is finally starting to want to cook. I’m so happy about it! I got him an adorable apron on clearance from Boden for about $8 (it says “SUPER” and it kills me) and he’s been proudly asking if he can “be a helper guy” any time I’m in the kitchen. Sophie usually wants to jump in too, and (even though it takes longer and there’s more mess to clean up) I love that I get to share something I love so much with two little people I love so much! These gluten free banana muffins have become somewhat of a Sunday staple for us in the last few months. Just about every week, Milo or Sophie will ask if we can make banana muffins. I always try to hide a few bananas a few days in advance so they can get ripe in time for Sunday afternoons. I make this recipe in my food processor 99% of the time, primarily because both children love to take turns pushing the buttons. One child gets to scoop ingredients, one child pushes buttons, and they trade often enough that no one screams and cries. The texture on these babies is PERFECT. 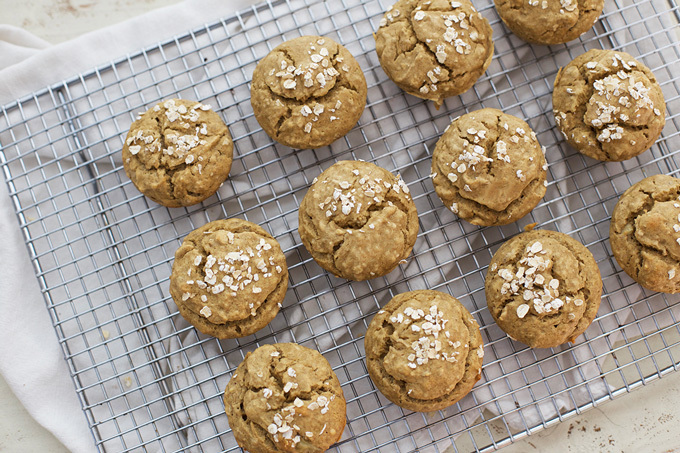 They’re light and fluffy, unlike so many of the gluten free muffins out there. I really appreciate that they’re naturally sweetened, and the little extra goodness from the oats makes my heart happy. Let’s Talk Flour. I used Bob’s Red Mill 1-to-1 Gluten Free Baking Mix. It’s perfect for easy gluten free baking and it’s a literal 1-to-1 substitute for standard white flour. If you’re not gluten free, you can swap out the gluten free flour blend for white flour. Sweetness. Depending on how sweet your bananas are (the riper the better), you may possibly want to add more maple syrup. You can go up to 1/2 cup without losing anything in texture. We’re just great with the 1/3 of a cup listed. 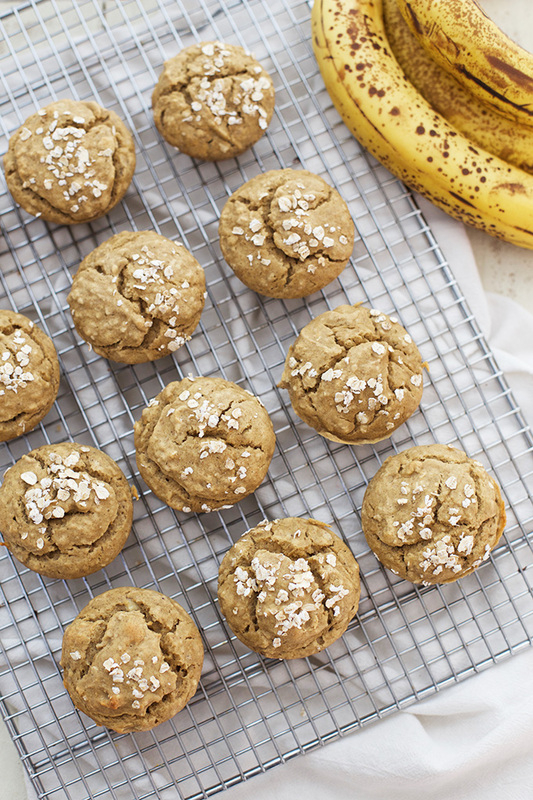 Our super-ripe bananas make these sweet and delicious without being one step away from a cupcake. 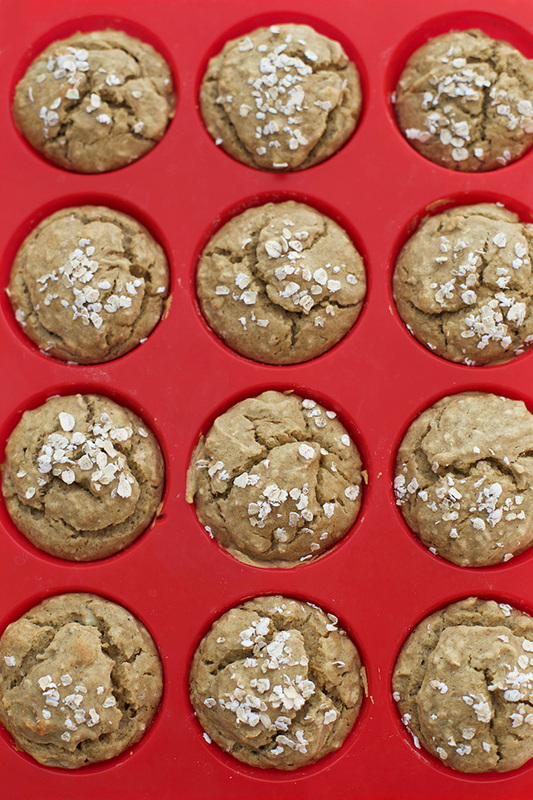 The Best Muffin Pan Ever. The last thing I’ll say is that I LOVE my silicone muffin pans. We make so many muffins that it’s more eco-friendly and budget friendly not to use paper liners. The silicone muffin pan is totally nonstick, dishwasher safe, and muffins cook evenly and pop right out. We use the mini size and the standard size (standard size is what you see pictured here), and love both. The mini size is perfect for packing in lunches or a little snack. In a food processor or stand mixer, combine bananas, oil/butter, syrup, milk, eggs, and vanilla until smooth. Add cinnamon, baking soda, salt, oats, and flour. Pulse until just combined. Scoop into muffin cups (if not using a silicone pan, you’ll want to grease or line the cups first). If desired, top with a sprinkle of oats. Bake at 350 degrees for 20-25 minutes, or until cooked through. Let cool and serve! My mom is coming to visit this weekend and she has celiacs. I can’t wait to spoil her with all this awesome GF stuff you’ve been posting! Thanks a million! These muffins look delicious! 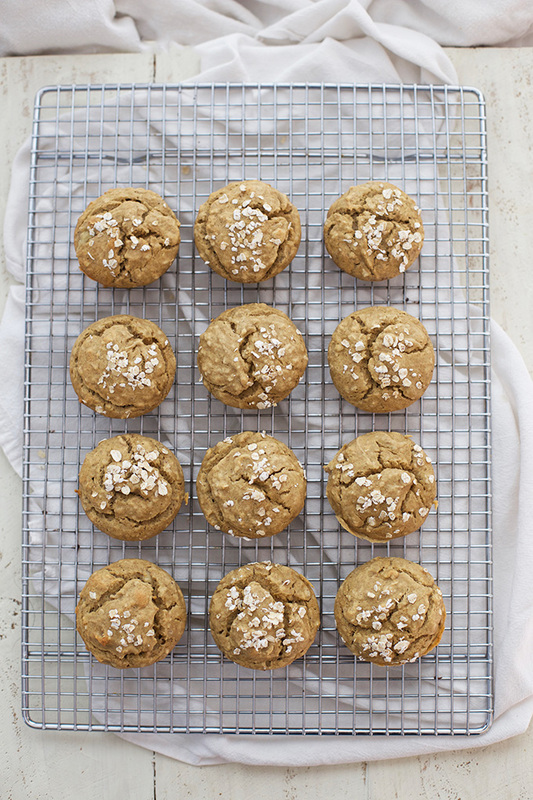 I’ve never tried a recipe with oats before so I’ll have to make these soon with the bananas we have on our counter! These sound and look AMAZING!! Brand new to gluten free and dairy free! Vera – Welcome to the club! It can seem very overwhelming at first, but here are a few posts that might be helpful. Going Gluten Free: The Basics. 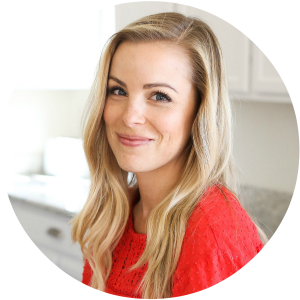 Going Gluten Free: Blogs, Books, and Brands I recommend. (This post is fairly old, so I’ve found some updated brands I prefer, but this is at least a start). The other thing I’d suggest is just focusing on whole foods rather than all the packaged products. You can spend a fortune on gluten free flours, breads, crackers, etc! Three years into this, I’d say my favorite gluten free flour is Bob’s Red Mill 1 to 1 Gluten Free Baking Mix. It works as a direct substitute for white flour in quick breads, savory dishes (thickening, etc. ), muffins, etc, and even some cookie and cake recipes. So you like Bob’s red mill one to one baking flour. I can use this in any recipe replacing flour with this one to one? Have a favorite muffin recipe I want to make and wondering if the Bob’s red mill one to one baking flour will work? Yes and no! For muffins, quick breads, etc. You should be able to easily swap the Bob’s flour in place of white flour in your favorite old recipes. It will almost surely work in your muffin recipe! It will not be a perfect substitute for more delicate baking–pie crust, yeast bread, etc. I used Agave cause I didn’t have maple syrup, and ghee. Also added chocolate chips and chopped pecans. Tried to mix it in my blender and it didn’t work. Made 48 yummy mini muffins! They passed my husband test. He couldn’t tell they are gluten free! Marcia – Those sound like great adaptations! I’m sorry about the blending not working–what kind of blender do you have? I’m excited to try pecans in my own muffins next time–that sounds delicious! I have been gluten free, due to Celiacs disease for 14 years. I have to first say that I absolutely dislike almost all gluten free bread products. Since I think that Bob’s Red Mill flour is the ONLY decent GF flour on the market, I decided to give these a try. WOW! These muffins are wonderful! The best I’ve had. Thank you for a great recipe! Since I was making banana chocolate chip muffins for the non-GF people, I made these with mini chocolate chips as well–delicious! Oh, I’m so glad! We just LOVE them! These are SO delicious!! I added walnuts! And didn’t have vanilla extract so added a vanilla bean cut up! Wonderful recipe🤗 Thanks so much! I bet they were INCREDIBLE with vanilla bean! YUM! I am looking forward to trying these but along with gluten, I can’t tolerate oats. Can you suggest something else? Should I add more flour if I omit the oats? Anne – I haven’t tried this with a substitution, but yes, I think adding a little more flour would help replace the oats! I’d love to know how it turns out if you try it! I added 1/4 cup flour instead of the oats. They are delicious. Thank you! Anne – SO glad to hear that! Thank you for reporting back! Now I can share for others in the future. Thank you so much! Sounds like a perfect plan for next time! I made them for a friend and then came home and made some for my family. ABSOLUTLEY DELICIOUS! We used Almond Flour and ghee and these are the best gluten and dairy free muffins I have ever made. I will make these many more times. Heather – I’m SO HAPPY to hear that! Also love that you tried using almond flour! How much almond flour did you end up using? I’d love to try them that way! This is a nice recipe. I had to. Lend agave and honey due to not having any maple syrup. Sweetness seems good. Also added chocolate chips to please the kids. Subbed flax egg, as we are off eggs. We used avocado oil rather than coconut oil (again based upon what was in the pantry). I wouldn’t use that oil again, as it added too much of a savory finish. You might consider omitting that from your list of recommended oils. Texture and moistness is great. Would give the recipe 4 stars, but can’t change rating below. Thanks so much for your feedback Jenny! So sorry you didn’t enjoy the avocado oil finish. When I’ve used it, it hasn’t been to savory for me, but I’m wondering if the other substitutions may have had something to do with it? Either way, it sounds like you have a great idea for next time! Thank you again for taking the time to share your feedback. I appreciate it! Can I use baking powder for this recipe since I don’t have baking soda on hand?? Daniela – I haven’t tried substituting baking powder for baking soda, but this article from Bon Appetit might be a good place to get some advice. I hope that helps! Any chance you know the carbohydrates in each muffin? I have a Type 1 Diabetic daughter who has dairy and wheat allergies. Brooke – I’m sorry, I don’t have nutrition facts available (hopefully soon!). You can always plug them into any free online calculator! My favorite is MyFitnessPal (the free app or site). Wishing you all the best!!! Tried the recipe and it was amazing!!! Finally one that works! Yay! I’m so glad you enjoyed it! Thank you for sharing! Great muffins! Even my gluten eating son loved them and didn’t realize he was eating gluten free. Thank you! Did you ever calculate the carbs? I am type one diabetic also. WOW! These were great!! I did tweek it a bit, added in 1/2 cup roughly choppped fresh/frozen cranberries and the zest of 1 orange, for flavor, added just a smidgin’ more ground oats and a teaspoon of baking powder to compensate for the added moisture and give it some more umph for lift, turned out delicious! Thanks for guiding me along this GF path! Next time I am going to add some more fiber, like ground flax, ground hemp of maybe some ground chia seeds, and sprinkle some course sugar across the top prior to baking. Thanks again so much!! Jeanne – WOW those sound delicious! I’ll have to try your cranberry-orange twist sometime! That sounds delicious! The only thing I did different was, I added about 3 TBL. of hemp hearts. I will definitely make again. Thanks for sharing this recipe!! OMG I’m not a big fan of eating gluten free even though I have too (and I am – most of the time) but I gotta say. OH MY GOSH are they YUMMY!!! YAAAAY!!! I’m so glad to hear that! I’m semi gluten-intolerant and have been looking for a banana bread recipe. I made this and baked it in a cake pan instead of muffins and my whole family loved it! I topped it with a chocolate tofu icing (sounds gross, I know, but it’s amazing). The only thing is that it took over an hour to bake. It could’ve been since I didn’t bake it like muffins but still, an hour is a long time. Also the texture was a little gummy, but bearable. Overall, would recommend this recipe. Alexa – I absolutely think the long bake time was because you made it as a cake instead of the muffin tins. That IS a long time! I’d recommend giving it a try as muffins sometime. It’s delish! Also – You might like my Almond Flour Banana Cake with dairy free chocolate ganache. It’s great (and a little lighter in texture). I made these with Namaste Flour (Found at costco) They turned out perfect! Oh good! I’ll have to try that mix. I’ve seen it! Excellent. I have zero complaints or changes. Thank you for a delicious gf muffin recipe! Made them today. Turned out very nice and moist . I used agave syrup instead of maple syrup and also added a handful of chopped walnuts. Will keep this recipe handy. Oh, I’m so glad you enjoyed them! The walnuts sound delicious! These muffins were delicious! 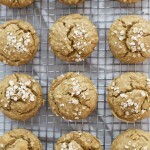 Best gluten free recipe I’ve been able to find. Even my son who is not gf loved them! They were very light and moist. Oh my goodness! I’m SO glad to hear that! Thank you so much for sharing!